Welcome to the QITE Program! 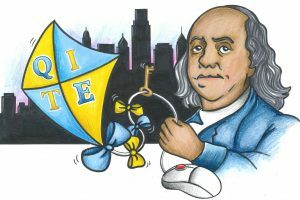 QITE (like Ben Franklin’s “kite”) is the name of the new top-tier Oracle business system being designed and developed to replace the Advantage Finance, HR, and Payroll systems that manage day to day business operations across the School District of Philadelphia. QITE is an acronym that stands for Quantum Intelligence & Technology Enterprise. This name emphasizes the role the system will play in providing leaders at all levels within the SDP with greater efficiencies and enhanced process effectiveness. QITE will also allow you to provide your data and reports in a fraction of the time. QITE will also allow users to enter, manage, and view their own personal information. We have a great team of talented and hard-working people involved on this big District-wide change. Go to our About and Frequently Asked Questions (FAQ) pages to know more about this program. And a big thank you to teacher Heather La Pera, the artist behind the Ben Franklin QITE art on this website! Let’s fly together on this QITE journey! Improve the efficiency and effectiveness of all business systems that support our teachers and administrators. Provide user-friendly technological solutions and resources that benefits all District staff. Improve quality and transparency of business reporting. … All while creating a positive transition experience for all users. Find out a little bit more about the QITE program and it's goals. When is this going to affect you? We gathered some questions and answers from project team members who have anticipated what District staff would like to know. A new look that is simple, clean, and intuitive. It's easy to use with menu-driven screens and icons that help you navigate. Screens will be similar to web pages you use as part of your personal online shopping tasks. No more TPERs! Time entry is electronic. Improved experience and optimized talent identification. Online access for Entry, Leave Management, and Benefits. Even from your phone. Faster and better communication with our vendors.